Co-located with The Strip’s first Lamborghini dealership, the Dal Toro Restaurant offers a unique combination of exotic Italian cuisine and probably the world’s most coveted Italian car brand. LAS VEGAS, NV—The new Dal Toro Restaurant at The Palazzo Tower of the Venetian Resort and Casino Las Vegas boasts an interesting adjunct to an outstanding dining experience. 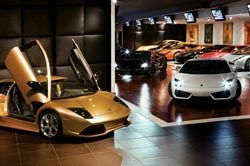 Co-located with The Strip’s first Lamborghini dealership, the location offers a unique combination of exotic Italian cuisine and probably the world’s most coveted Italian car brand. To support this Las Vegas attraction is a flexible AV system designed and installed by Paradise Production Services. Powered by Lab.gruppen and controlled by Crestron, the AV system includes loudspeakers from Martin Audio, Bose, and JBL Professional. The new systems were commissioned by Paradise president Carlos Henao, working closely with Barracco and dealership staff. “Lorenzo was looking for top-of-the-line brands, but pretty much left it up to us to design the AV system,” Henao said. Video displays installed throughout the restaurant, bar, and car dealership include 13 Toshiba 37HL67 37-inch, five 42HL167 42-inch, and a single 52HL167 52-inch screen, plus a Sanyo 3K projector. “A dozen of the 37-inch screens are installed above individual stalls for the vehicles being displayed in a lower showroom area,” Henao explained. Henao specified JBL Contractor Series cabinets for the restaurant terrace and Bose Panaray column arrays throughout the car dealership, restaurant, and bar areas. Additionally, a range of Martin Audio C8.1T coaxial and JBL Control 312CS subwoofer in-ceiling speakers are used throughout. Lab.gruppen C-Series four-channel amplifiers power the JBL and Bose speakers, while the Martin ceiling units are driven by four Crest Series 2208s. For overall system equalization, delay compensation, and level adjustment, Henao specified a pair of BSS Audio Soundweb 9088s, two Bose Panaray controllers, and three BSS 9010 Jellyfish wall units. Playback sources for the 16-zone Creston Pro2 dual-bus system—10 throughout the restaurant and six for the dealership, including the sales floor and merchandizing areas—comprise three cable boxes, DVD, CD, and MP3 players, and an Alcorn McBride DVM-HD.